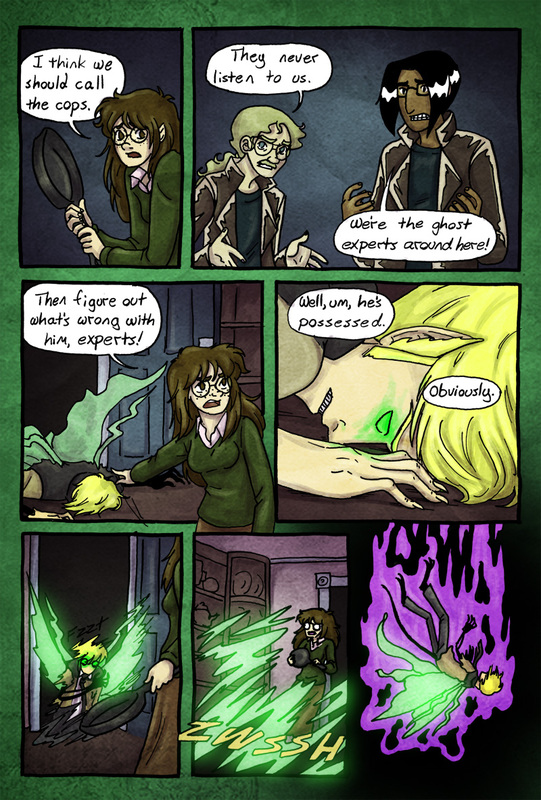 They are the ghostiest of experts. Cmon gang, back to the mystery machine. We got a monster to catch. Ian sure does like his random portals. well he’s got no control over the portals, so it might not be him making them. Or he really, really hates them. Did his sideburns go spikey and stick to his ears when they went pointy, do you think? That’s what it looks like to me, but I’m not sure. Yeah, it just doesn’t look like it’s growing directly out of his ears, is all. I think you’re probably right, though. Hey Kytri, have you ever read any of the “Dresden Files” books by Jim Butcher? I know of them but I haven\’t read them. Haven\’t watched the TV show either, I\’m afraid. The cops never listen to Howard and Phillip? Did they call up about ghosts before now? Because that sounds exactly like them, to be honest. Ghost at the burrito gong. Ghost on the police line trying to convince them to stop calling. i’m sure they have a diary explicitly detailing every ghost encounter they’ve had. with their names on the front.